This beautiful 126 acre reservoir with 928 acres of open space offers hiking, biking, boating, fishing, picnicking and restroom facilities. This hike goes along the Upper Rim Trail around Lafayette Reservoir for 4.7 hilly miles. 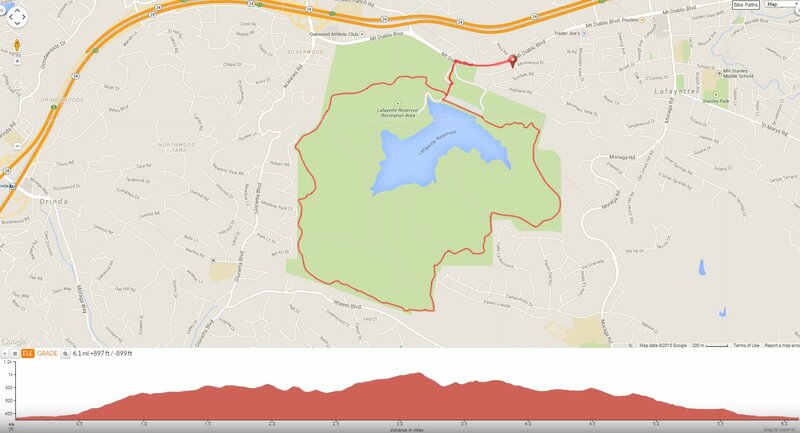 Walk from Village Center and head west on Mt Diablo Blvd to the Lafayette Reservoir Recreation Area entrance. Follow the path that leads up to the large paved reservoir parking lot. Mile 0.5-You’ll come to a fish cleaning station and restroom area; take the trail between the two and begin the Upper Rim trail loop. The trail goes uphill under the tall pines pass a small playground and shaded picnic area. The gradual incline weaves in and out of the oak woodlands along the ridge. The fire road leads out to upper valley grasslands with views of the reservoir and Mt Diablo! Mile 0.9-at the signed Westview trail post: go straight to stay on the Rim Trail. The rolling terrain takes you in and out of the canopy of trees to the open ridge. The Rim Trail continues up along the exposed ridge and winds down through the grasslands with fabulous views of the surrounding hills. Mile 1.9-the series of up and down leads to a vista point with a single bench. The trail drops down from the ridge with views of the surrounding residential neighborhoods. It continues along the open ridge top with views of the reservoir and Briones Hills. The fire road kicks up for a short steep climb followed by a few more rolling climbs before reaching the water tank at Mile 3.0. There is a water fountain around the east side of the tank. Continue uphill on the trail next to the satellite dish to the highest point of the Rim Trail. Stop for a moment and enjoy the panoramic views of Mt Diablo to the east and sweeping south views of Las Trampas! The trail drops down on a steep descent with rooftop views of Orinda’s Campolindo neighborhoods to the trailhead at Paseo Grande. Mile 3.3-the Rim Trail kicks up for a steep ascent back up the ridge followed by another series of rolling climbs. The Rim Trail continues through the open grasslands. Enjoy the grand views of the reservoir and Mt Diablo. Mile 4.9-st the Sunset Trail junction: turn left and continue downhill towards the paved Lakeside Nature Trail. Mile 5.1-turn right onto the Lakeside Nature Trail to the parking lot area. Stop and enjoy the views of the reservoir, white pelicans and cormorants. Exit the rec area and retrace your steps back to Village Center. This hilly hike on the Upper Rim Trail circles around Lafayette Reservoir with 360 views from the vista points along the rolling ridge. You’ll enjoy the natural beauty of EBMUD’s watershed lands and reservoir. This is not a hard circuit but the constant ups and downs can be a strain if you’re not prepared for the dramatic elevation changes. You can also work up to hiking the Upper Rim Trail by walking the popular paved 2.7 miles Lakeside Nature Trail. Parking: Free street parking on Village Center in Lafayette or fee for parking at the reservoir lot. This is a good hike a lot of hill climbs. You have to be in some shape to do the rim hike. I had a great time and it was sweaty in July early at 9:00 start. Glad you enjoyed the hike!